• PLOT SUMMARY: Written by James Robinson. Art by Eddy Barrows, Ruy José. 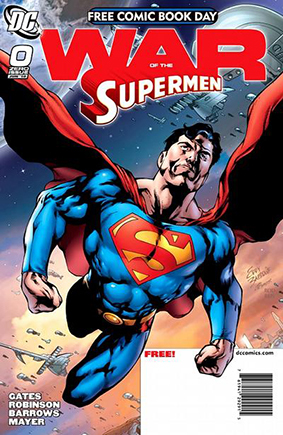 A war is coming, and all that stands between Earth and 100,000 vengeful supermen is one Superman! The conflict between Superman and General Zod erupts into all-out war this summer in a series that will shatter the worlds of Superman, Supergirl and the entire DC Universe - all brought to you by the hit creative team of James Robinson and Eddy Barrows! This special #0 issue featuring all-new material previews the conflicts to come while spotlighting a savage strike on Metropolis and the world - an attack that will shake Superman to his very core. After this, there's no turning back - the War of the Supermen is here!